The Guardian writes today of a "new strategic landscape" taking shape as long-range Russian bomber patrols cross over into "remote areas" of ungoverned ocean air, brushing up against the aerial terrain of 21st-century British sovereignty – England scrambles its jets, phone calls are made, the crisis is defused – and as newly affiliated militaries co-simulate and train, linking distant nations in strategy. 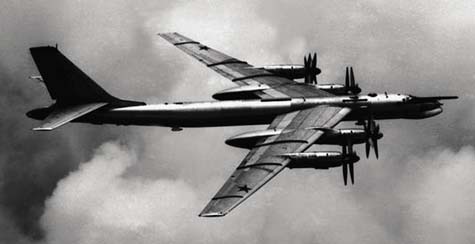 [Image: A Russian TU-95; the TU-95s were originally "designed as bombers but are now frequently used for maritime reconnaissance." They have recently been intercepted in the north Atlantic]. "A burst of war games and military manoeuvres around the world hints at a new strategic landscape," we read. NATO is training in Sevastopol, for instance, a former Soviet sea port; Japan, Singapore, Australia, and the United States are hosting "war exercises" with India in the Bay of Bengal; China has constructed "an intelligence listening post on the Cocos Islands" in that same Bay of Bengal (a future flash point? ), even while helping Pakistan and Bangladesh "build deep-water ports"; and, of course, "Russia and China held their largest ever war games in the Urals last month," during which uniformed men and armed helicopters terrorized fake villages and filled empty architecture with smoke. Stripped of ornament and devoid of decoration, such training sites are the military's version of a Modernist utopia: eminently functional, purpose-built, a testing ground for new forms of management and planning, they are temporary cities built for and by war – destroyed just as quickly by the forces that assembled them. It's kind of like how the Olympics aren't really about the games at all, but infrastructure and urban marketability, sports just being an entertaining by-product. or how facebook isn't really about social networking, but is actually just a tool for data mining. I read today, in Forum Magazine (a PACOM publication) that in late 2006, the US and PRC completed a number of joint maritime exercises aimed at "advancing common objectives" and "increasing air and maritime safety". I wanted to send you a press release, but since you do not publish an email address, I'll do it this way: have you seen MIMOA yet? a new website on Modern Architecture in Europe that provides exactly the information you need to find and visit objects - in real life. www.mimoa.eu Developed over the past 6 months, it will officially launch next week, with a growing number of active contributors, projects etc. a) Some of the hard-right blogs I visit that you would THINK would be playing up the Russian menace are instead dismissing it, citing Russia's totally destroyed economy. These bomber moves are seen as empty chest pounding, similar to Putin's beefcake photo shoots.